I seem to have gone through more polish again this month! Leighton Denny - Slick Tips - I liked this cuticle oil although it does really hurt if you get it in the eye. I have another cuticle oil to use up so won't be repurchasing this any time soon (full review). W7 - Silver Earthquake - This polish never really shattered properly and it has gone all weird so chucking it out (swatch here). W7 - Red Earthquake - The opacity of this polish wasn't good enough to work over darker shades which is what I would have liked it to have done. It went funny again so that's why its going in the bin (swatch here). Mini Topcoat - This came with something and didn't take me long to use it up. Sally Hansen - Lavender Cloud - Opaque in two coats, really good staple off white. I won't be repurchasing as I much prefer Sinful Colors Snow Me White (swatch here). No.7 - Betty Blues - This was gloopy as soon as I got it, it smelt really weird as well. I have enough navy shimmer polishes not to need a new one. 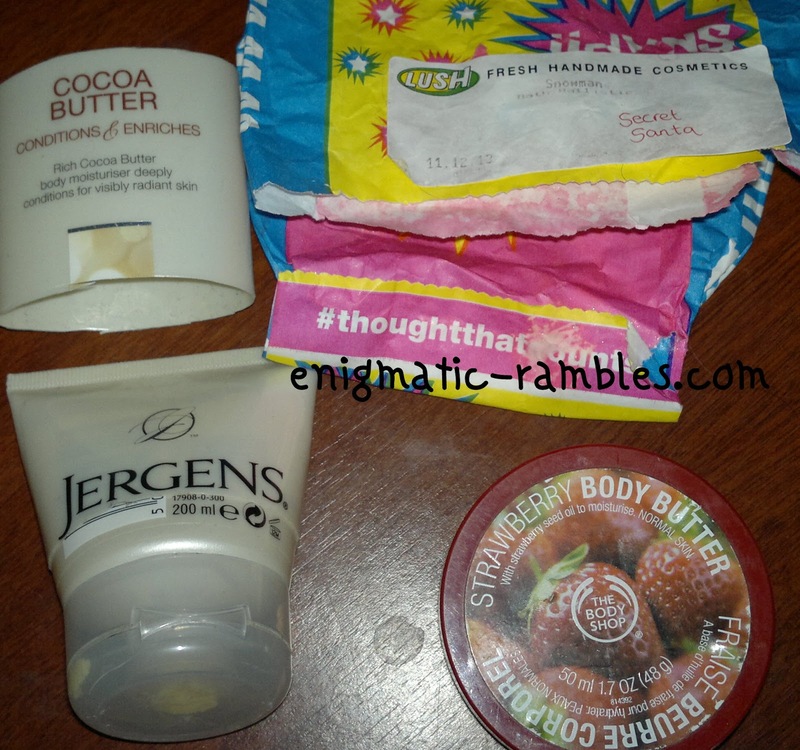 Jergens - Cocoa Butter - Nice product, I liked to use it for my legs during the summer. We don't get much summer so it took a while to use up. I have plenty other ones to use up so not a repurchase for me (full review). Lush - Secret Santa Bath Ballistic - I split this over two baths, it was quite a hefty bath bomb. Nice but not something I would repurchase if it were available, full review will be appearing at some point. The Body Shop - Strawberry Body Butter - This is a nice body butter, not too heavy like a lot of the Body Shop range. I have other scents already so not going to repurchase this any time soon. ELF - Complexion Perfection (Tone Correcting Powder - Light) - I'm a big fan of this as a setting powder, although it can give you a white cast if you aren't careful. I have a couple of these as back ups (full review here). ELF - Mineral Primer - This was the older packaging which was annoying as I had to saw it open to use the entire of the bottle. Still the new packaging is a lot better and I think I have only one more left of this older packaging (review here). Lee Stafford - Dry Shampoo - I lost this for a long time, it smells strongly of the pink scent. Too over powering for me, although on the plus side it didn't leave any white residue in my hair. 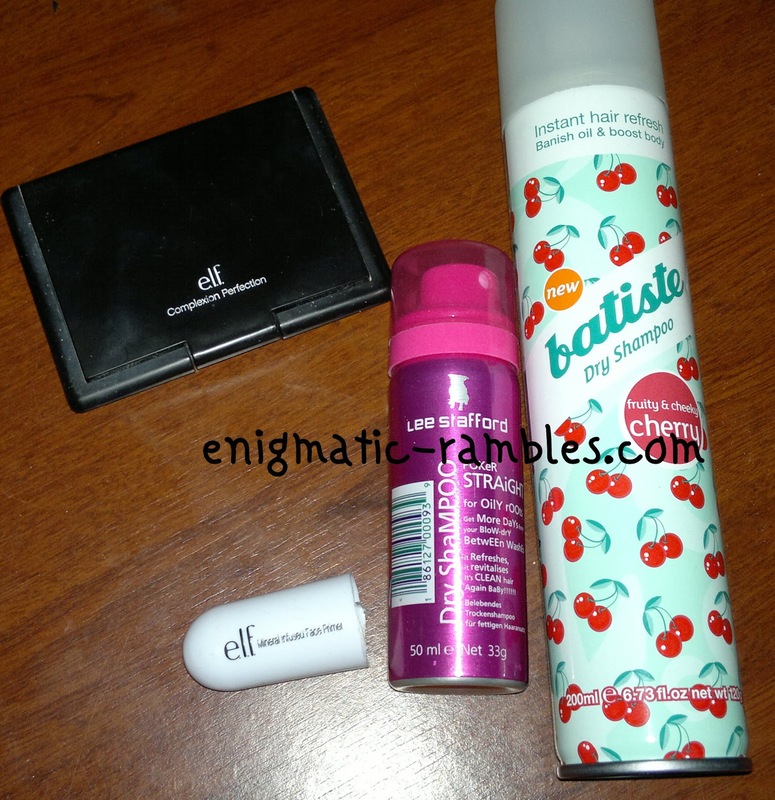 Batiste - Cherry Dry Shampoo - I like this, it works and is relatively cheap. I have back ups for this already (full review here).